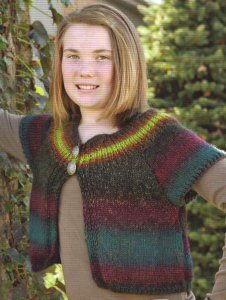 Taken from Universal Yarns Pattern Books - Classic Shades Kids: This is a great pattern for women and girls of any age! Try it with one color or use two different colors for added shading effects! This pattern is from Universal Yarns Pattern Books - Classic Shades Kids. US 8 straights OR US 9 straights and 2 1.25" buttons are required but not included. Finished Bust Measurements: 24 (25.5", 27", 29", 31", 33", 35" 37", 41", 47")". Color Shown is #712 Harvest.